THE most remarkable aspect about the 2018 All-Ireland SFC – other than Dublin’s annexation of a fourth consecutive Sam Maguire – was the collectively tepid challenge fronted by their accepted rivals. Mayo, habitually Dublin’s flintiest opponents this decade, never made it into the newly-minted ‘Super 8s’. Kerry, meanwhile, never got out of those All-Ireland quarter-final group stages and while Tyrone made the All-Ireland final, they dished up an unimaginative and submissive display, the second year in succession they had come to Croke Park and failed to even syncopate Dublin’s rhythm. Yet if this year’s League was indicative of anything, it’s that the group of teams likeliest to halt Dublin’s march to a historic fifth All-Ireland title in a row are all better built to do so than last year. Here, in descending order, are their principle challengers. THE Mayo Paradox: They are, without question, the greatest danger to Dublin’s pending immortality due to Sunday’s League title triumph, the continuation of their Croke Park dominance over Kerry and their repeated ability to come excruciatingly close to beating Jim Gavin’s team in the Championship. Yet they’ve never won against a Gavin-managed Dublin, a run stretching back 14 games and seven years. And their most recent meeting ended in an eight-point loss to a team in the middle of their worst League campaign since 2012. The form of captain Diarmuid O’Connor and the rehabilitated Robbie Hennelly are two major positives to glean from spring, as is their ‘find’ of the League, Matthew Ruane. Soon, the influential Cillian O’Connor will come back into their attack and if nothing else, solve Mayo’s free-taking issues. 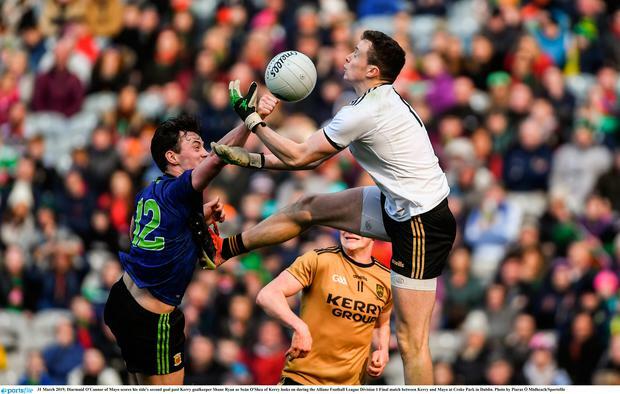 FOR a while there it seemed as though Peter Keane was conducting a staggered unveiling of the next great Kerry team as weekly, a fresh talent was revealed to the football world they were about to collectively conquer. In Sunday’s League final, Keane started six players who weren’t on Eamonn Fitzmaurice’s panel last year and duly, they lacked both the required leadership and physicality to haul themselves out of trouble when Mayo exerted the heaviest pressure. There are lingering questions about their defensive organisation too and for all the undeniable talent of David Clifford and Seán O’Shea, are they ready to lead a Kerry attack to what would rank highly among their sweetest All-Irelands? MORE surprising than Mickey Harte’s tactical U-turn on the night his team bullied Dublin in Croke Park four weeks ago was the fact that such a shrewd tactician had persevered with the same failed methods so many times up until that point. Whatever the merits of attempting to contain Dublin with a densely-populated and organised defence, running the ball endlessly from deep had become a largely impotent way of breaking Gavin’s team down. The positioning of Cathal McShane and Mattie Donnelly in their inside line and a nakedly direct approach to feeding them attacked Dublin’s only glaring vulnerability. Such tactical flexibility and a regenerated physical edge suddenly reinstated that old Tyrone menace. THE All-Ireland contender most cloaked in secrecy after the League. Kevin Walsh’s targets for the year are undocumented but it was patently clear from early spring that winning the League wasn’t high among them. The imminent returns from injury of Damien Comer, Declan Kyne and Cillian McDaid plus the additions of Corofin players like Ian Burke, Kieran Molloy and Liam Silke will obviously strengthen Walsh’s hand. What is less clear is how he intends to set his team up. Having established defensive stability, Walsh will be acutely aware that Galway’s scoring tallies against top-tier sides requires improvement. Clearly though, he has the weapons. THEY edge out Monaghan here on the basis of how they finished the League, albeit in Division 2, and their status as reigning Ulster champions. Both in quality and variety, Declan Bonner has a pick of forwards possibly second only to Dublin themselves, with Jamie Brennan, Oisín Gallen and Daire Ó Baoill all adding significantly. Paddy McBrearty’s form can’t be guaranteed after such a long injury but Michael Murphy has been superb.